Astro Motel grand opening and bike ride with Andy Hampsten happens Thursday, Jan. 18, 323 Santa Rosa Ave., Santa Rosa. Ride at 9am; ribbon cutting at 2pm. Free; RSVP required by Jan. 13. 707.200.4655. LONG AND WINDING ROADS Andy Hampsten says Sonoma County offers a wealth of world-class rides. 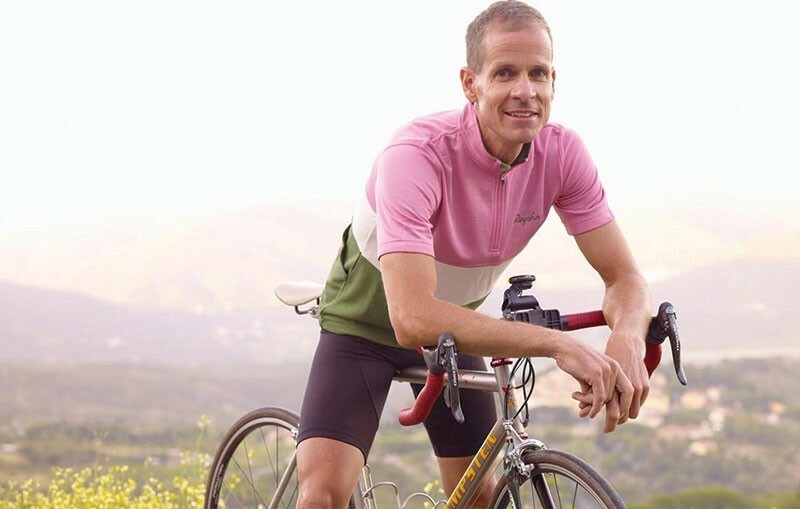 Retired professional cyclist Andy Hampsten first visited Santa Rosa as a teenager in the early 1980s to train on the winding roads of Sonoma County at the invitation of Santa Rosa native and cyclist Gavin Chilcott. "My first ride was actually up Trinity Grade [in Sonoma Valley]," says Hampsten. "It was so, so beautiful, really challenging riding, but just stunning and really fun." While he's never officially lived in Santa Rosa, the Boulder, Colo.–based Hampsten often visits several times a year to keep his riding chops up. "In all stages, I got to train in Santa Rosa, and that really helped my career," he says. After a successful professional riding career, these days Hampsten spends his time leading cycling tours of Tuscany with his company Cinghiale, and he hopes to be able to do something similar in Sonoma County. "Every direction out of Santa Rosa for cyclists is spectacular," he says. Hampsten is also an investor in the Spinster Sisters restaurant, located in Santa Rosa's South of A Street arts district. In addition, he's invested in the newly renovated Astro Motel, adjacent on Santa Rosa Avenue, owned and operated by the same folks who run the Spinsters Sisters. In a region bursting with scenic bike-riding options, Hampsten sees Santa Rosa and the Astro Motel as a potential new hub for both professional and amateur cycling enthusiasts. And he's helping kick off the trend by leading a grand opening bike ride that launches from the Astro Motel on Thursday, Jan. 18. After fueling up with coffee in the motel's stylish lounge and tuning up the bikes at the motel's onsite repair shop, Hampsten will take a group out on several West Sonoma County roads leading to Occidental, Freestone and Sebastopol and back to Santa Rosa. After the ride, the Astro Motel's official grand-opening celebration continues with a ribbon cutting, tour and reception. Both events require an RSVP by Jan. 13 to attend. The "West County Meander," as Hampsten calls it, is one of his favorite rides in the North Bay. Starting with the Joe Rodota Trail, linking downtown Santa Rosa with Sebastopol, riders get to experience the picturesque apple orchards and wineries of Graton and Forestville that give way to the redwoods. Hampsten also likes the ranching country of the Sonoma Mountain and Lawndale route that circles from Santa Rosa to Glen Ellen and back to Rohnert Park. And for serious riders, he recommends Cavedale Road and Trinity Grade, "not because they're fun on the legs," says Hampsten, but because "the Valley of the Moon is so dramatic and gorgeous." Going north out of Santa Rosa, Hampsten also recommends the Chalk Hill Loop in Windsor and cycling through the Alexander and Dry Creek valleys in Healdsburg. "And if I have energy, I go out Skaggs Springs all the way to the coast," says Hampsten. "For me, that's the super-classic ride." Though Hampsten has not visited the North Bay since the October wildfires, he knows that extensive parts of some of these trails were decimated. "I watched it, horrified and terrified for friends and the people who did lose their lives and homes," he says. "As a visitor to Santa Rosa, it's heartbreaking to see so many people lose so much." Hampsten hopes he can take his model for group tours and translate it into a Sonoma County experience that begins and ends at the Astro. A once famously downtrodden den of vice, the Astro Motel's retro-future charm has been revitalized into a minimalist boutique inn with 30-plus rooms outfitted with mid-century furnishings, original art and stylish amenities. "What I really love about this place the most is how many local artists came together to really make this place shine," says the hotel's day manager Sam Hamby. From the bathroom tiles to the fruit-tree-lined courtyard, the Astro's aesthetic was conceived and crafted by North Bay hands. "The idea behind this is we're bringing the community up by using the community," says Hamby. The motel has already opened its doors as a FEMA-approved emergency lodging for victims of the wildfires, and hosted a New Year's Eve concert in the lounge. "This place is completely changed now," he says. "We've had so many people from the neighborhood stop by to say thank you, they never thought they'd see this."